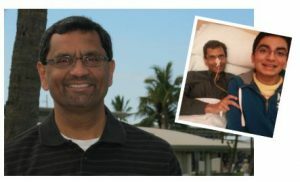 His family, friends, and hospice caregivers all seem to choose the same words to describe Ravi Mahadevan: courage, grace, ever smiling, and unfailingly kind. His son, Ashwin, writes how his Appa (father) would be among the last to exit an airplane because he’d been helping some strangers with their luggage. In keeping with his Hindu traditions, Ravi observed the ritual of Ayusha Homam soon after his 50th birthday in July 2013. From words meaning age and fire, this ceremony honors life and is believed to help restore vitality, pave the way toward a long life, and fortify those suffering from serious illness. Months earlier, the successful engineer and nuclear industry executive had voiced serious gastrointestinal health concern sto his wife, Nandini Natrajan. His family’sworst fears were realized in April 2014when he was diagnosed with an inoperable tumor on his pancreas. Ravi remained hopeful, and pursued aggressive treatments over the next 11 months at local hospitals and out-of-state cancer centers. He sought out natural healing regimens, herbal remedies from India, and a Chicago integrative clinic blending conventional cancer care with holistic approaches. But, by March 2015, it was apparent these approaches were not helping. His family faced a difficult choice. “Ravi could pursue more chemo, an extremely risky surgery, a feeding tube,” says Nandini, “but why go through that when these measures were not likely to work? Samaritan Hospice has Two Inpatient Centers. Learn About Them Both Now. ”Samaritan had come highly recommended by friends in the medical community. “We discussed our choices with our son, and Ravi chose Samaritan’s comfort care as his path,” says Nandini. Ravi’s pain and symptoms required round-the-clock supervised care at the Samaritan Inpatient Hospice Center in Virtua, Mt. Holly. Once there, still thinking of others, he enlisted social worker Colleen Fritsch to help him realize his wish to become anorgan donor. Happily, he learned he could still share the gift of his corneas. Ravi’s chosen path helped him serve as a guru (enlightened teacher) to his Indian community. Nandini says, “He was the first young death in our circle, and, I hope, he has helped to shift our cultural paradigm. The idea of hospice care is not well understood. It can be a negative word to many not familiar with this type of care. ”Over the next 17 days, Ravi’s tranquility inspired his family, coworkers, and friends, who visited from as far away as Canada, Indonesia, and India, and even the Samaritan staff. These staff members, with assistance from Virtua administrators, helped Nandini organize a party in a hospital conference room – attended by more than 50 people– to celebrate the couple’s 19th wedding anniversary. “I can’t say enough good things about the care and love our whole family received from everyone,” she says. On April 7, 2015, Ravi passed the way he chose to – at peace, with family and friend sat his bedside. Hours later, staff from Gift of Life honored his wish to harvest his corneas. Nandini says, “I heard recently that his cornea was successfully transplanted into a woman suffering from a previously failed transplant. ”Ravi continues to see the world through this woman’s eyes – and she through his! In gratitude, Nandini requested gifts to Samaritan in Ravi’s memory, and generously supports Samaritan herself. She is also assisting with culturally sensitive outreach within the Indian and Pakistani community to foster Samaritan’s Diversity Initiative goal – greater access for all in our community. “Samaritan was there for us, and is here for everyone. I encourage the entire community to generously support the important services Samaritan provides to patients and families,”she says. For more information about Samaritan’s Diversity Initiative, contact Joanne Rosen,at 856-552-3254 or jrosen@samaritannj.org.